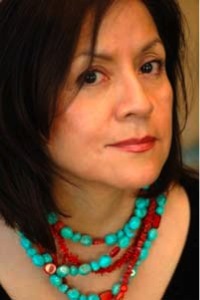 Laura Tohe is Diné (Navajo). She is Tsénáhábiãnii (Sleepy Rock People clan) and born for the Tódich’inii (Bitter Water clan). Her books include No Parole Today, Making Friends with Water (chapbook), and Sister Nations (edited). Her most recent book, Tseyi, Deep in the Rock won the 2007 Glyph award for Best Poetry and Best Book by Arizona Book Association. She wrote a commissioned libretto, Enemy Slayer, A Navajo Oratorio, for the Phoenix Symphony Orchestra that made its world premiere in 2008. In 2009 she was nominated for an Arizona Arts Award. She is a Professor of English at Arizona State University. Her current book project is an oral history book on the Navajo Code Talkers.